From G's to Gents was an MTV reality television series which features misdirected young men willing to change their lives and become gentlemen. The show is hosted by Fonzworth Bentley, and premiered on MTV on July 15, 2008. The objective of the show is to make the transformation from a roughneck to a sophisticated gentleman within the given time. 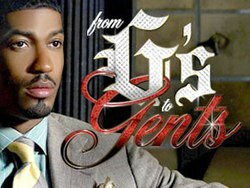 The second season, From G's To Gents 2, premiered on February 10, 2009. The voting procedure differs from other voting processes, due to the use of an "Ebony Sphere" or "Black Ball" to decide the fate of other cast members. Each player places a BlackBall in the corresponding box labeled with an opposing players name. At that time, the two (or more) players with the most votes are taken in front of Fonzworth Bentley. The chosen players are then assessed, and Bentley alone makes the final decision. ^ "Development Update: Week of November 12–16". The Futon Critic. November 16, 2007. Retrieved 2008-05-20. ^ Braxton, Greg (July 15, 2008). "Jamie Foxx's reality show 'From G's to Gents'". Los Angeles Times. Retrieved 2008-09-21.